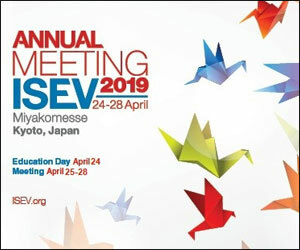 It is becoming increasingly clear that small vesicles released from cells (extracellular vesicles [EVs]) represent a heterogeneous population implicated in cell-to-cell communication. 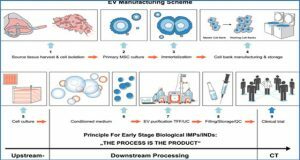 The classifications and nomenclature of EVs are evolving as enrichment strategies and specific characteristics are being unraveled. 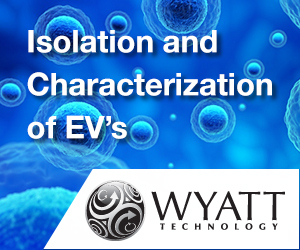 At present, physical properties of EVs-namely, size, shape, and density-are often used to identify subpopulations of EVs. 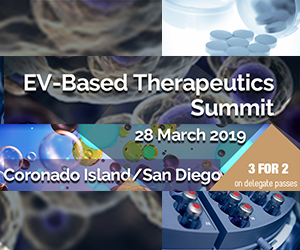 A distinct group of EVs, termed exosomes, largely defined by their small size (∼40-150 nm) and proposed subcellular origin, has been extensively studied in several aspects of cancer biology. 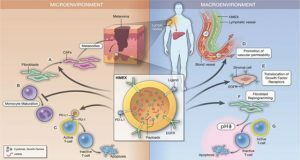 Exosomes are implicated in modulating behavior of cancer cells as well as the immune and angiogenic responses in tumors, possibly contributing to cancer progression locally and systemically. 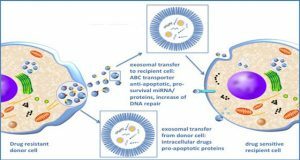 Most intriguingly, the nucleic acid content of exosomes has been proposed to play a role in oncogenic transformation and transfer of cancer-specific genome to promote cancer pathogenesis. 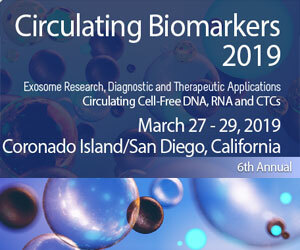 Here, researchers from the University of Texas MD Anderson Cancer Center, specifically focus on the discovery of exosomal DNA, studies related to the origin of genomic DNA in exosomes, and its utility in cancer diagnosis and disease monitoring. 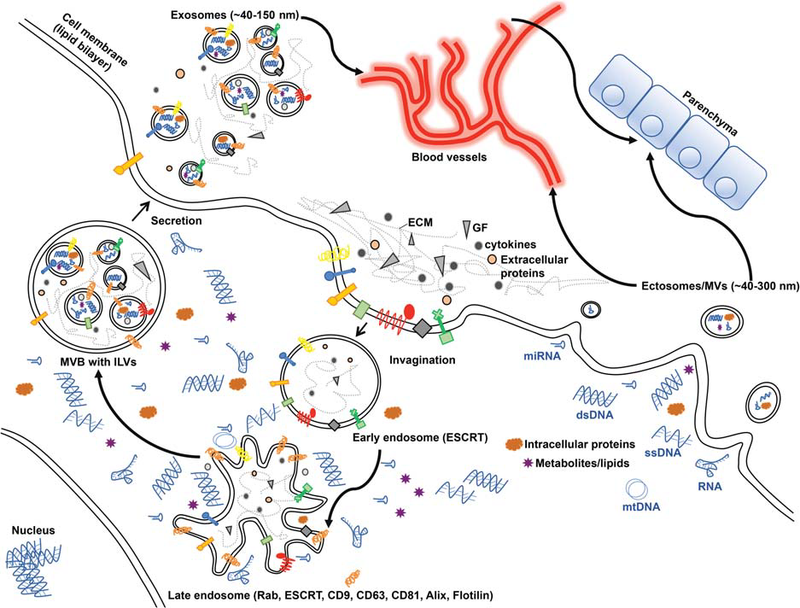 The intracellular vesicles mature into the early and late endosomes, implicating the endosomal sorting complexes required for transport (ESCRT) machinery and Rab proteins. Proteins (CD9, CD63, CD81, Alix, Flotilin) that decorate the late endosomes are often used as exosome markers following their secretion. The formation of the multivesicular body (MVB) containing the intraluminal vesicles (ILVs) follows a secondary invagination of the late endosome membranes, trapping within newly forming ILVs components of the cytosol (metabolites, intracellular proteins, nucleic acids). 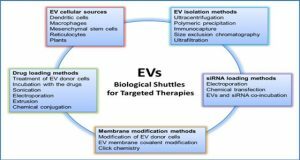 Following fusion of the MVs with the plasma membrane, the ILVs are released and referred to as exosomes. 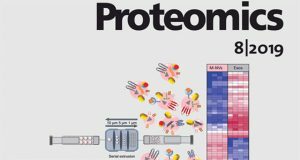 The surface proteins on the released exosomes are conformed similarly to their presentation on the plasma membrane. The exosomes enter the circulation or surrounding parenchyma. 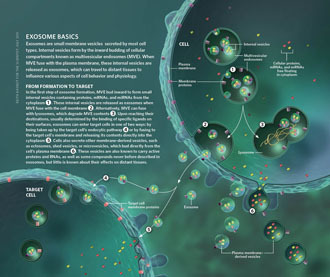 Ectosomes or microvesicles (MVs), in contrast, emerge from the budding of the plasma membrane and are often larger in size when compared to exosomes.